Bringing together "Old School Biker Values" and "New World Biker Attitudes"
Our club motto is "Old School Values, New World Attitudes." Our motto most succinctly describes our mission. We are serious riders. We do not just ride our bikes on weekends or wear our leathers as fashion statements. We seriously reflect the values of brotherhood/sisterhood, biker camaraderie and of supporting the larger biker community as well as our local communities. That mostly reflects the "Old School" part. At the same time, we are not interested in separatism in any way. We are not interested in playing into any of the divisions that have cropped up in the motorcycling and motorcycling club world over the years. We do not promote the idea that one bike brand, one gender, one race or one biker "attitude" is better, more genuine or is the more "real" expression of what a biker is. That mostly reflects the "New World" part. Reflecting the great diversity that exists in the worldwide motorcycling community is also a very important objective of the club. Toward this end, our club is open to male and female riders, riders of every ethnicity, riders of all brands of motorcycles and people from many different walks of life and life experiences. 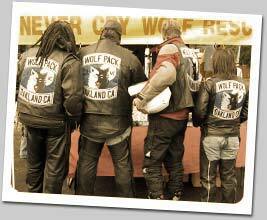 Like the wolf packs found in nature, we strive to have members from a large age range and various generations as well. Our belief in having members from a large age range is not just a belief rooted in the idea that the young can learn from the older or that the young can provide fresh energy and enthusiasm. It is both of these ideas and more. It is also an idea rooted in the belief that we all can learn something from each other and contribute something to the growth of one another no matter what our age or what the nature of our life experience. We do not judge other clubs for any decisions they make. That�s not what we�re about. We respect all other clubs and their interests. We will strive to support as many clubs in the areas we have chapters as possible regardless of what part of the biker set they belong to. We will do this by attending as many club events, rallies and party�s as we�re able to.